In 1993 Ducati launched the then groundbreaking Monster 900, little did they realise just how successful it would be over the next decade. 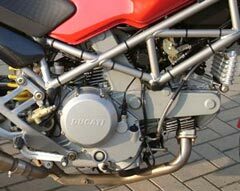 It was, and still is somewhat different to the everyday motorcycles from other manufacturers, but since it's introduction copies of Ducati's 'street bike' have appeared from almost everyone. 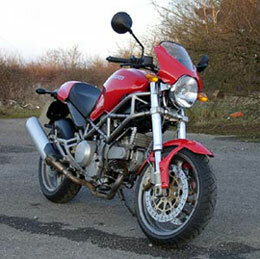 The Monster range has sold over 100,000 bikes throughout the world and spawned numerous engine sizes and versions from the initial 900cc model in 1993. At Munich last year Ducati launched their new engine range and it is no surprise that they have made their appearance in this years Monster range. Starting with the 620ie (road test on this model next week) and topping out with the awesome S4, the 800 is slap bang in the middle of the range and replaces the old 750. So you now have a choice of seven models and 4 engine sizes, enough to give just about everyone a version of a Monster they will like, if you are in the market for a naked street bike. So why is it when you get on a Monster someone throws a switch and turns you into a complete nutter! Maybe it's me but all you want to do is use the midrange of this bike to its utmost. It wheelies off the throttle, it powers out of corners and roundabouts with total composure, it has good ground clearance (which I just tested!) and is comfortable to ride all day. At speed it's still surprisingly easy to ride and fairly easy on the arms, with just a flyscreen and wide bars you would think it would be a strain but to my surprise it was fine even at 120+. The new motor in this version is a real gem and can be revved right through the range and the 6 speed box up to about 125mph or so in very quick time, but this misses the point with this bike, it's all about the mid-range on the Monster 800. Ducati have made a lot of modifications to the new Monster including upping the capacity to 803cc, a lighter clutch and alloy cage, a new gearbox and a totally smooth injection system. With power output now at around 74bhp (more than the original 900) and a whole lot of torque, you can have a lot of fun on this bike. Riding the Monster is fun, real fun! It is really easy in traffic and yet will blast up to 3 figures plus in seconds, the most fun is definitely in the middle figures though. I found myself riding most of the time on back roads at around 70-90mph and just enjoying the feel of this brilliant bike. It has a distinct feel to it unlike no other bike on the market, something that resembles riding a supermoto but with the added performance package thrown in. It's difficult to describe but you find yourself suddenly opening the throttle at every opportunity just to feel the front lift and the rush of torque! It really is motorcycling in its element. 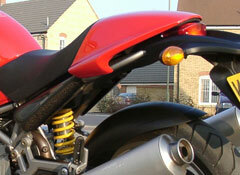 Add a good suspension set up to a brilliant motor and the Monster 800 shines. The front end has 43mm inverted forks (unfortunately not adjustable) and the rear has a Sachs unit with pre-load and rebound damping. With this set up you would think that it would have its restrictions, but it seems to do the job extremely well and it really does take a lot to unsettle or make the bike misbehave in any way. The new Monsters also have the trellis frame and box-section swing arm from the S4. The handling of this new Monster is pin sharp, and with a low centre of gravity adds to the overall feel in traffic and out on the open road. At low speeds you really have no problem filtering, the smoothness of the bike combined with the low seating position and wide flat bars place no strain on your wrists. And when you get out on the open road you can really exploit the potential of the new Monster. Braking comes courtesy of Brembo. Twin 320mm discs with 'Gold series' 4 piston calipers up front, and a rear of 245mm from the same stable ensures very rapid stopping power if things suddenly go wrong up ahead! and there's plenty of feel from the brake set up which just adds to the riding pleasure with this bike. We had this bike on test in February and the roads were to say the least somewhat salted! The overall quality and finish of the new Monster is just excellent, even though it is designed primarily for more sunny and dry days it stood up to the wet British winter well. A mixture of salt and rain does no good for alloy bits and especially on a naked bike like the Monster, but with a quick sponge over the new gleam was restored and during 2 relatively wet weeks I didn't notice any signs of corrosion on the exposed alloy parts. I had a chance to take Simon as pillion (see second opinion below) on the somewhat small rear seat on our return to Ducati. Once the seat cowl had been removed via two retaining bolts under the seat you are presented with a sloping rear seat pad which really is no that attractive to spend much time on, but the same criticism can be leveled against the vast majority of bikes on today's market! To sum up, the new Monster is a total enhancement on the original concept of the bike, a practical yet fun bike that you can just get on and ride either sensibly or not as the case may be! It offers very little in the way of creature comforts or frills, but that's what the Monster has always been about. The new 800 motor is an absolute gem and of course it has the street cred of the Ducati name. 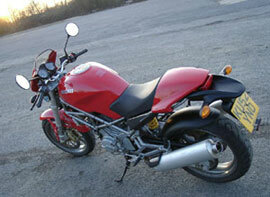 With a price of around £6,500 its a real bargain and deserves a place at the top of the list! Sadly I only had a short chance to ride this particular little monster, but that was enough to tell me a few key things about it. First and foremost, this is a bike you ride with a smile firmly glued onto your face. It's almost impossible not to have fun on it - the enthusiastic power delivery and nimble handling see to that. OK, so a naked bike can do some things to take the smile off your face at high speed, mainly along the lines of tearing your arms out of their sockets while treating you to the gentle caress of February weather, unspoiled by the effects of a fairing. Or even, to be honest, that dinky little screen. But forget trying for speed records and concentrate on the twisty or, even better, the urban, and just feel that smile grow. This is a top town bike. 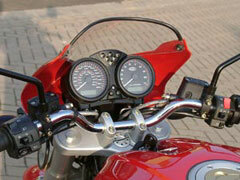 Steering lock is reasonable, the clutch isn't too heavy, brakes are ace and the balance is just right for filtering. Plus, of course, with 800cc and pretty low gearing, you'll be sure to get off the lights quick enough to stay out of trouble once you've wriggled down to the front of the queue. 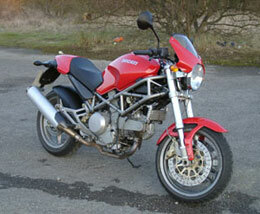 Read external Ducati Monster 800 reviews on Ciao.